＊Refines all types of acnes and large pores. ＊Exfoliates the dead cells, improves uneven skin tone and texture, and softens lines and wrinkles. Mandelic acid, a simple alpha hydroxyl acid (AHA) derived from bitter almonds, has a long history of use in the medical community as an antibacterial, particularly in the treatment of urinary tract infection. Mandelic acid has skin benefits when it is applied in skin care. Generally speaking, the most irritating side effects of chemical peel are itching and skin discoloration (also called post-inflammatory hyperpigmentation, PIH). Yet, unlike other glycolic acid, the molecules of mandelic acid are larger and do not penetrate the skin as deeply. As a result, there’s less overall irritation, redness, or scars when comparing with other AHAs. Mandelic acid peel once a week is allowed. Other than its exceptional anti-acne property, mandelic acid can depress Tyrosinase and Tyrosine to restrain the growth of pigment and stimulate the growth of collagen and hyaloid acid in the demis as well as to strengthen the firmness of the skin. 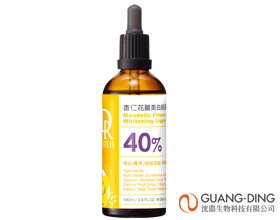 Dr. Hsieh Mandelic Acid is developed by Dr. Hsieh Medical Skin Center and manufactured in mass production following SOP of Guang-Ding Biotech Co. to make sure the safety and validity of each skin care product. Dr. Hsieh has been studied mandelic acid for years. Ever since first launching mandelic acid at-home chemical peel line in 2010, the sales has reached 880,000 units now. We also have won many internet awards and have built very good word-of-mouth. Dr. Hsieh has been been recognized as No.1 brand in Mandelic acid in the market. We have introduced Mandelic Acid Medical Skin Care Line in 2013 for chemical peel market. 3 key formulas. Whitening and Refining spots in 2 weeks. Brightening in 1 day. Dr. Hsieh Skin Medical Center has studied more than 30,000 native plants in Asia and analyzed the functionality on 381 flowers. From the numerous tests and repeated experiments, we found out that precious plants, like Roselle, Herb trinity, Briar, Camu Camu possess certain energy that can be used as whitening compound with mandelic acid, and L-ascorbic acid as a natural but powerful whitening product. It not only controls and restrains activation of tyrosinase, but also stops the generation pigment, reduces the spots, refines discoloration, brightens the skin and keeps the skin at its best condition. Ingredients: (1) L-Ascorbic acid: an exceptional antioxidant which can prevent damage to skin from UVA and UVB. (2)Whitening Flower Acid: fades the pigment and tyrosinase. Whitening the skin (3) Mandelic acid: Exfoliates the dead skin cells and penetrate the skin easily. Refine skin discoloration. Chemical peeling gently without many side effects. Benefits: Fades the growth of melanin, reduces spots, brightens the tones and textures of the skin, refines scars, and uneven skin tone. Best suited for persons with skin problems of uneven skin tone, darker skin tones, sun-related skin care issues (such as spots, freckles, brown patch, and etc. ), and sun damaged skin. Instruction: Use once every 1 or 2 weeks. The whole process takes around 30 to 40 minutes. You will see obvious whitening effects after 4 to 6 consecutive treatments. Generally speaking, chemical peeling with mandelic acid is gentle and can be used regularly to maintain the whitening of the skin. Dr. Hsieh Skin Medical Center has studied more than 30,000 native plants in Asia and analyzed the functionality on 381 flowers. From the numerous tests and repeated experiments, we found out that precious plants, like Roselle, Herb trinity, Briar, Camu Camu possess certain energy that can be used as whitening compound with mandelic acid, and L-ascorbic acid as a natural but powerful whitening product. It not only controls and restrains activation of tyrosinase, but also stops the generation pigment, reduces the spots, refines discoloration, brightens the skin and keeps the skin at its best condition. Ingredients: (1) L-Ascorbic acid: an exceptional antioxidant which can prevent damage to skin from UVA and UVB. (2)Whitening Flower Acid: fades the pigment and tyrosinase. Whitening the skin (3) Mandelic acid: Exfoliates the dead skin cells and penetrate the skin easily. Refine skin discoloration. Chemical peeling gently without many side effects. Benefits: Fades the growth of melanin, reduces spots, brightens the tones and textures of the skin, refines scars, and uneven skin tone. Best suited for persons with skin problems of uneven skin tone, darker skin tones, sun-related skin care issues (such as spots, freckles, brown patch, and etc. ), and sun damaged skin. Instruction: Use once every 1 or 2 weeks. The whole process takes around 30 to 40 minutes. You will see obvious whitening effects after 4 to 6 consecutive treatments. Generally speaking, chemical peeling with mandelic acid is gentle and can be used regularly to maintain the whitening of the skin.